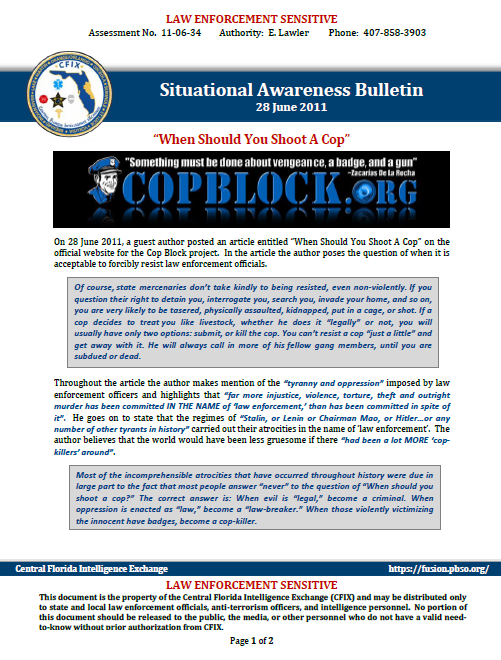 On 28 June 2011, a guest author posted an article entitled “When Should You Shoot A Cop” on the official website for the Cop Block project. In the article the author poses the question of when it is acceptable to forcibly resist law enforcement officials. Throughout the article the author makes mention of the “tyranny and oppression” imposed by law enforcement officers and highlights that “far more injustice, violence, torture, theft and outright murder has been committed IN THE NAME of ‘law enforcement,’ than has been committed in spite of it”. He goes on to state that the regimes of “Stalin, or Lenin or Chairman Mao, or Hitler…or any number of other tyrants in history” carried out their atrocities in the name of ‘law enforcement’. The author believes that the world would have been less gruesome if there “had been a lot MORE ‘cop-killers’ around”. [Analyst Notes] Cop Block, based on the description on their Facebook page, is a “decentralized project supported by a diverse group of individuals united by their shared goals of police accountability, education of individual rights and the dissemination of effective tactics to utilize while filming police.” The project was founded in 2010 by an individual who started Cop Block due to his personal experiences with law enforcement when he was “a victim of the war on drugs, twice”. In addition to posting information about incidents involving police actions [articles, photos, and/or videos], the contributors to the site also call for those interested in helping “the cause” to participate in “call floods”, in which numerous ‘activists’ call a specific agency to “express [their] disapproval [of] the police for their actions”. In December 2010, Cop Block activists, in association with the Bradley Manning Support Network, call flooded the offices of the Quantico Base Commander and the Marine Brig Commanding Officer demanding that Manning be released immediately and to inform them that “exposing the crimes of a government is heroic”. Currently there is no specific threat to law enforcement personnel based on this article; however, this bulletin is being provided for situational awareness. Although it is unclear exactly how many individuals are involved in the Cop Block project, the forum on the official website has 127 members and their Facebook group has been “liked” by over 10,000 people. In order to protect the online identity of you and your agency, the utilization of an anonymizer is recommended when viewing information on this site and others like it.